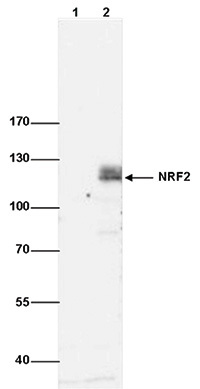 Request a quote for a bulk order for NRF2 polyclonal antibody. Please fill out the form here below. Your local sales account manager will get in touch with you shortly and send you a quotation based on your requirements. 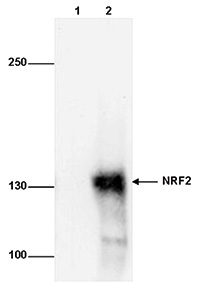 Polyclonal antibody raised in rabbit against NRF2 (NF-E2-Related Factor 2), using a recombinant protein. PBS containing 20% glycerol and 0.025% ProClin 300. * Please note that the optimal antibody amount per ChIP should be determined by the end-user. We recommend testing 1-5 µg per IP. 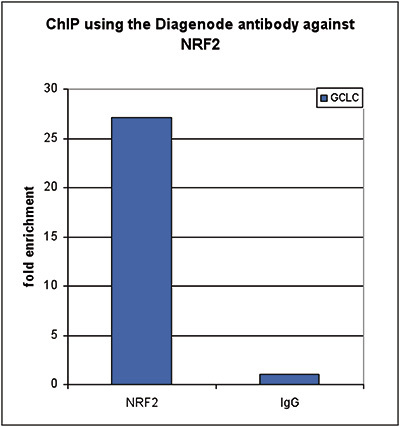 ChIP was performed on HeLa cells with 5 µg of the Diagenode antibody against NRF2 (Cat. No. C15410242). IgG (5 µg/IP) was used as negative IP control. QPCR was performed with primers for the GCLC gene. Figure 1 shows the fold enrichment over the IgG negative control. HeLa cells were stained with the Diagenode antibody against NRF2 (Cat. No. C15410242). Cells were fixed with 4% formaldehyde for 15 min at RT and blocked with PBS/TX-100 containing 5% normal goat serum and 1% BSA. The cells were immunofluorescently labeled with the NRF2 antibody (left) diluted 1:500 in blocking solution. 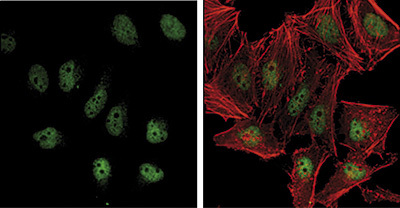 The right panel shows costaining with Phalloidin, a cytoskeleton marker. Paraffin-embedded Cal27 xenograft was analysed by immunohistochemical analysis, using the Diagenode antibody against NRF2 (Cat. No. C15410242) diluted 1:500. Whole cell extracts from 293T cells (30 µg) transfected with a 3xFlag-tagged NRF2 expression vector (lane 2) and untransfected control cells (lane 1) were analysed by western blot using the Diagenode antibody against NRF2 (Cat. No. C15410242) diluted 1:1,000. The position of the protein of interest is indicated on the right; the marker (in kDa) is shown on the left. Nuclear extracts from MDA-MB-231 cells (30 µg) treated with 30 µM tBHQ for 4 hours (lane 2) or untreated control cells (lane 1) were analysed by western blot using the Diagenode antibody against NRF2 (cat. No. C15410242) diluted 1:1,000. The position of the protein of interest is indicated on the right; the marker (in kDa) is shown on the left. Immunoprecipitation was performed on whole cell extracts from HepG2 cells using 5 µg of the Diagenode antibody against NRF2 (Cat. No. C15410242) (lane 2) or with an equal amount of rabbit IgG (lane 1). 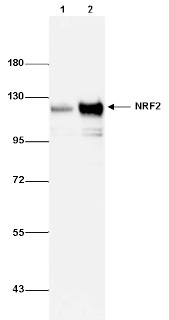 The immunoprecipitated NRF22 protein was detected by western blot with the NRF2 antibody diluted 1:1,000. 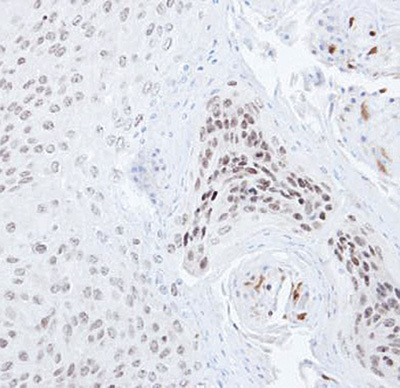 Diagenode strongly recommends using this:	NRF2 polyclonal antibody (Diagenode Cat# C15410242-100 Lot# 42347). Click here to copy to clipboard.